The Lester Hofheimer residence designed by B.L. Stern c. 1917 in Woodmere. Hofheimer was president of the Nathan Hofheimer Foundation, a philanthropic organization founded by his father. It appears that the house has since been demolished. 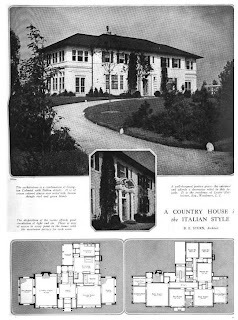 Photo from House & Garden, 1918. Too bad it didn't have a tile roof, but handsome none-the-less. Res. & Garage: $18,000. 2 1/2 sty. 73x54. Wood Lane & Willor rd., Woodmere, L.I., N.Y. Archt. B.L. Stern, 36 W. 45th st., New York City. Owner, Lester Hofheimer, 1733 Broadway, New York City. Frame. Bldr. John P. Streigler, Edgewater Crest, Far Rockaway, L.I. Plmg. & htg. let to Smith Bros., Far Rockaway. I looked at the blocks between Wood Lane & Willow Road and didn't see it. There are a few older houses, but the area is largely built over. As two commentors have already said, handsome. Confident, understated, and the floor plan is a solid A. A library would have been nice, but it seems space constraints prevented it. Does not state the amount of land. Anybody have an idea?